Marvel Two-in-One #96: Visiting Hours! Ben is in the hospital, and has been visited by a variety of super-types and friends. Reed is worried that some of their enemies might try to attack Ben while he's down, and the Mad Thinker, elsewhere, has computed that one of those foes will indeed reach the Thing and that Ben will die in exactly 53.07 minutes. Well, no, but on page 15, panel 4, a bored Ben mutters "I can't take much more of this! A hospital's no place for a clobberin' kid like me!" No Petunia. Seems like everyone else in the Marvel Universe is here, but no Petunia. This story immediately follows the brutal beating Ben took at the hands of the Champion in Marvel Two-in-One Annual 7. 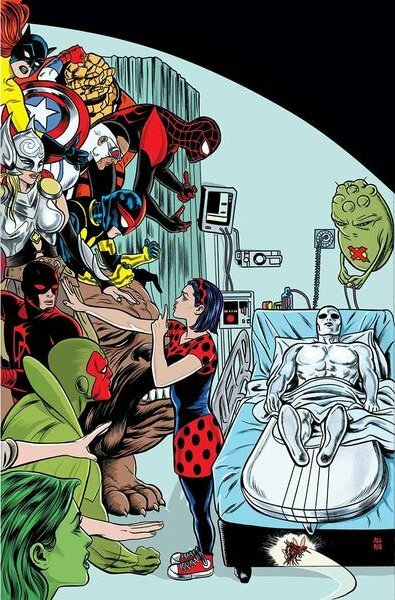 Thats why he's in a hospital bed throughout the issue. On Page 2, panel 1, Captain America comments that the Avengers are postponing their poker game until Ben is back on his feet. Gotta love the continuing mention of that poker game! The Yankee game Ben had been planning to watch on TV is rained out and replaced by a soap opera: "One Life to Suffer". Someone else's review of this issue can be found at http://www.samruby.com/OtherTitles/FantasticFour/marveltwoinone096.htm. Help me out- I'm missing an ID on one of the people people here. Towards the back of the book, there's a scene with tons of heroes sitting on the couch in the waiting room. Who's on the far right hand end of the couch, with his back to us? So... cut to 2016, and I'm reading the newly released Silver Surfer #3 (written by Dan Slott, who also wrote the excellent 2006 The Thing series). It's a very enjoyable issue, very Ben-centric, with Ben, under the control of an alien, fighting the Surfer, until he breaks through by strength of willpower and the two team up. Very enjoyable issue, and it ends with the Surfer dead or dying. Flip to the final page, with a "You want to know what happens next? Don't miss Silver Surfer #4" blurb, and the cover seen here to the left. Compares nicely, doesn't it? The perfect finish to a Ben-centric book (particularly right now, in an FF-less time). I don't know whose idea it was, and I suspect no one but me will notice, but a big tip of the hat and 'thank you' to you for the MTIO tribute, perfectly placed at the back of a great Ben book.